Having no artistic skills at all, I buy shoes that I can’t really decorate since I wouldn’t know what to do with them if I did and they would like like crap if I even tried to paint or draw something on them. However, there are some people out there that like to buy shoes that can be easily customized because unlike me, they have the artistic skill required to draw something other than the worlds ugliest stick figures. In this particular case, one of those people also happens to be a Doctor Who fan. 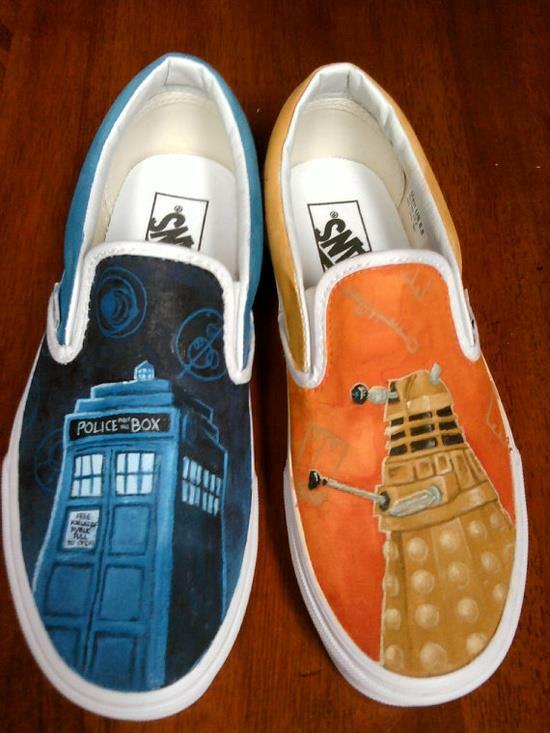 Any Doctor Who fan is sure to appreciate these hand painted VANS sneakers made to look like the TARDIS and a Dalek. Unfortunately, I don’t know who painted these awesome shoes to give them credit so if you know who did this to these shoes, please let us know in the comments below so they can get the credit they deserve! Speaking of hand painted Doctor Who shoes, if you love the ones below, I suggest you also check out the 10th and 11th Doctor shoes I posted a while back as well as the black and white Doctor Who shoes that I think might be my all time favorites. Until recently, for about the past year or so, I have been wearing Legend of Zelda hats whenever I would leave the house (now I wear a God of War hat). I would always get complements on my Zelda hats from pretty much any gamer that I would meet which always made my day. However, I have never really wanted to sport Zelda on my feet until I saw this amazing hand painted Ocarina of Time shoes. 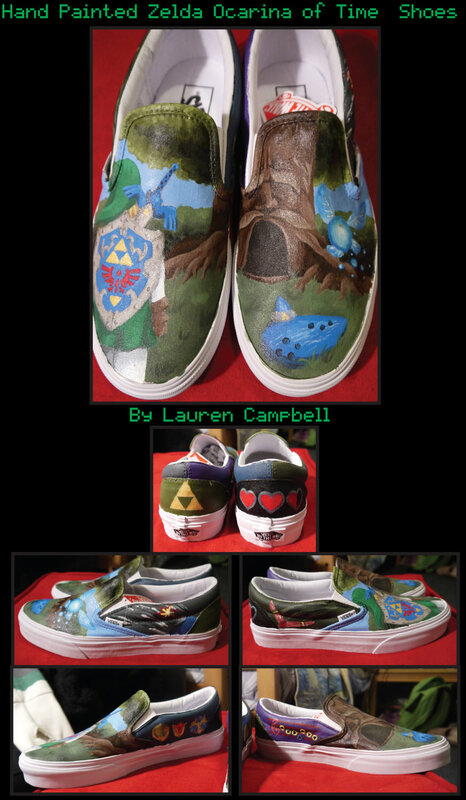 These amazing hand painted Legend of Zelda: Ocarina of time Vans shoes were made by Lauren Campbell. The best part is that she sells custom shoes like these! 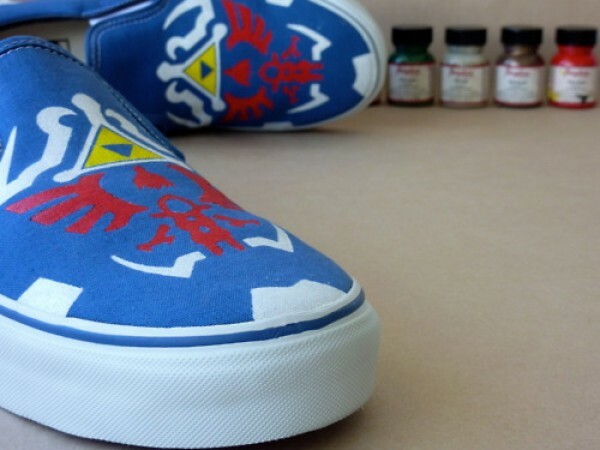 On her Etsy page, you can get a custom pair of these Legend of Zelda shoes for just $100. That seems like a bargain considering I pay at least that for my non-painted tennis shoes. If you get a custom pair from her, let us know in the comments below and feel free to share pictures as I would love to see them! When it comes to shoes, I am a loyal New Balance guy, but as much as I like their shoes, they don’t really have any that are good for customizing like these shoes or any of the others that I have posted on here. I would be lying if I said I wasn’t just a little jealous of those who wear Vans shoes like these that they are able to make something cool with them. In this case, Kyozokicks is selling these awesome hand-painted Legend of Zelda ‘Twilight Princess’ Vans sneakers for $195. That is about $75 more than I care to spend on a pair of shoes but admittedly my shoes are boring by comparison. These are definitely a must have for Zelda fans (mens sizes only)! 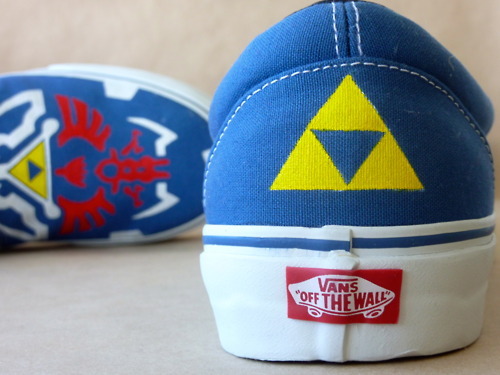 I’ve never been one to wear VANS shoes (I am a New Balance guy), but if I ever decided to give them a shot, I would probably have to spring for these amazing, hand-painted Legend of Zelda shoes! 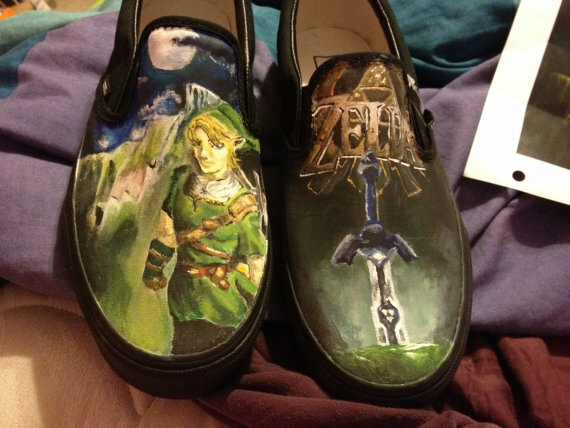 Not only do these shoes look comfortable, the Legend of Zelda paint job they have been given is pretty cool too! Etsy seller EpicCrafts4You is the person behind these awesome shoes and she is selling these custom Legend of Zelda VANS for $100. Apparently it takes 3-7 days to make and ship them which is pretty good compared to many I have seen. I want a pair! 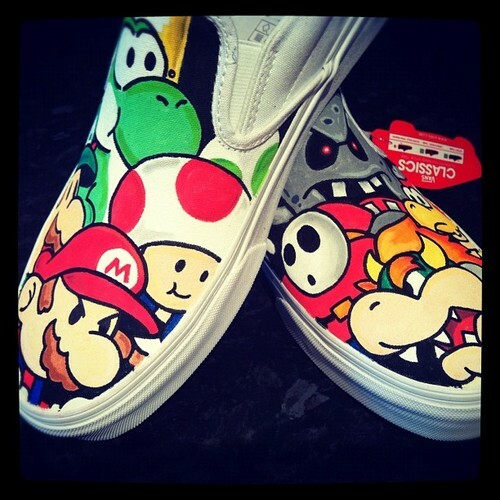 Need some cartoony and geeky shoes? 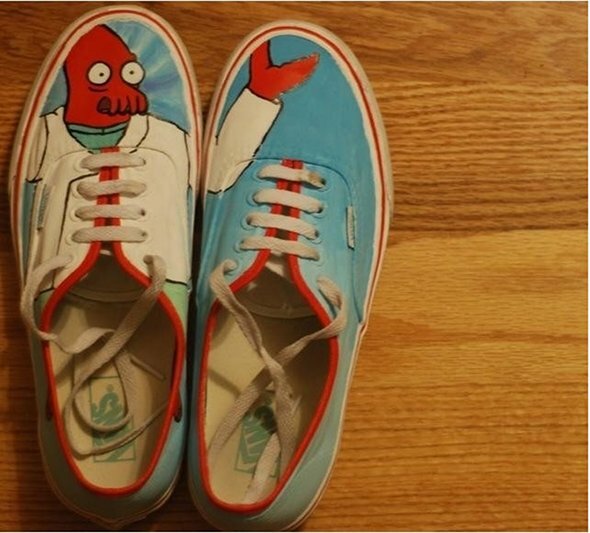 Then perhaps you should do like this person and paint a pair of Vans sneakers to look like Zoidberg from Futurama. Unfortunately, the right shoe only makes sense when you put it next to the left shoe but together, these shoes are a pair of awesome. Now, who wants to make me a pair of Bender shoes? Pass this along to any Futurama fans you know! Like Fanboy Fashion on Facebook!